A telescope opens up a whole new world to children. However, not all children’s telescopes are made equal. Some are nothing more than gimmicks barely passable as the real deal. With our guide, you can purchase the best telescope for kids that will last for many nights under the stars. Despite being an affordable telescope, the Celestron PowerSeeker 70AZ is not cheap in construction or performance by any means. In fact, although it is often recommended as a telescope for children, it’s rarely marketed as such. 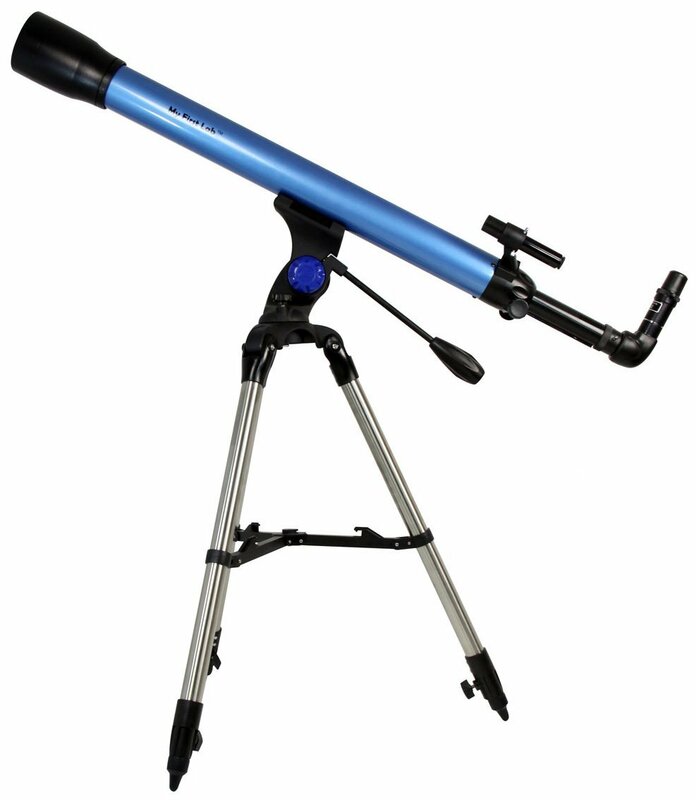 Celestron is known for quality, and even though this scope is at the lower end of the products they offer, it is within the price range of most quality kid’s telescopes AND it is good enough to be used well past just the “beginner” stage of astronomy and even into intermediate celestial observing. Its 70mm aperture, 700mm focal length, and 3x Barlow lens lend both children and adults a detailed view of the nighttime sky. Using this telescope, the craters on the moon or the rings on Saturn should be clearly visible. The included SkyX Planetarium software offers children the ability to locate and learn about any one of 10,000 nighttime objects, while its no­tool setup makes it fast and easy to get the telescope working right out of the box. To make it even easier to use, consumers can align the scope in the daytime and boasts an altazimuth instead of an equatorial mount. The addition of a two ­year warranty helps to give consumers the confidence that they are purchasing a quality product. The only downside to the PowerSeeker is its inability to follow the objects being observed automatically, requiring the user to manually follow them in order to keep them from disappearing from sight. The TwinStar AstroMark telescope is an excellent choice for introducing children to astronomy because it is simple to use. This telescope boasts an altazimuth mount and regular-­sized tripod that allows the scope to be set up within five minutes of the box being opened. In addition, the telescope works on a point and shoot basis, allowing even children to easily operate the telescope without the frustration of using a more complicated telescope. Besides its simplicity of use, the AstroMark offers good magnification in two eyepieces, from 30x to 75x. This telescope also makes a good choice for children because it can be used not only to observe the nighttime sky but also to explore terrestrial objects such as mountains and trees. Its design makes it comfortable to use for most children and adults, while it also makes a good choice for anyone living in an apartment and needing a lightweight, easy to use, and soundly­performing scope. The Educational Insights Telescope Set combines a telescope and microscope into a single set. The set is designed to offer an introduction to astronomy and microbiology to children 8 and up. The telescope boasts magnification from 20x to 80x and comes with two eyepieces. Its tabletop design make it portable and easy for children to use. The microscope magnifies up to 600x and comes with pre-­prepared slides as well as the option for children to create their own slides to explore. Consumers report that the set is occasionally difficult to set up, but that it is capable of capturing the interest of children and therefore offering a fun window into the world of astronomy and of microscopes. The My First Lab Stargazer is a quality telescope built to last. Its durable construction distinguish it from other children’s telescopes, which sometimes receive criticism for feeling too flimsy. This scope rests on a metal tripod which can be adjusted based on the height of the child using the tool. Its glass optics and stable, steel tripod base guarantee that it will survive use even by children who can sometimes be rough with their belongings. In addition, the Stargazer performs well. The telescope offers four levels of magnification (45x, m90x, 100x, and 150x), along with a 2x barlow lens and 9mm and 20mm eyepieces. The result is a tool that allows children to enjoy their very first views of objects such as the moon, stars, or other planets. Other appealing features of the scope include an altazimuth mount and ability to swivel for even easier operation. Consumers report having an easy time setting up the scope and enjoying relatively detailed views of the nighttime sky, such as the rings on Saturn. The TwinStar AstroMark portable refractor telescope is an excellent choice for children because of its versatility. First, the scope can be used to enjoy a wide array of terrestrial views, from birds and animals to far­off city views. These views are made possible by the scope’s refractor setup and 45 ­degree prism that automatically provides views right side up. In addition, kids can use the telescope to explore nebulae, enjoy deep space views, and gain detailed looks at objects such as the moon, Jupiter, and Saturn. These views are made possible by the 16x and 40x magnification, 400mm focal length, and 80mm lens. In addition to these views, the AstroMark is portable and easy to use, with a miniature tripod. Its accessories, such as Kellner eyepieces and finder scope round out its powerful capabilities, enjoyable views, and child-­friendly size and ease of use. Consumers in particular praise the finder scope for being easy to use. The only downside to the telescope is that the optics themselves may not always be as good as they are in more expensive or advanced telescopes, though they should still provide engaging and detailed views for children and beginner stargazers. The market is filled with different types of telescopes, but we can narrow it down to three general types of telescopes: refractors, reflectors (Newtonians), and catadioptric telescopes which are hybrids of the first two types. It is best to start simple for your child’s first telescope, and we will leave out reviewing catadioptric telescopes. Refractors and Newtonians will show everything a young stargazer could dream of exploring. A reflector, also called a Newtonian, uses mirrors to gather light. It makes a good first telescope for several reasons. The mirrors are relatively cheap to manufacturer, and they are light too. You can get a nice big Newtonian for a very reasonable price, and as you will see, the bigger the primary objective, the more light the telescope can gather. Another advantage is Newtonians don’t suffer from chromatic aberrations which is an optical flaw common to lenses. On the other hand, Newtonians use two mirrors which can become misaligned with handling and transporting, and will need to be collimated. You could have this done professionally, but it isn’t too hard to do for your child. You may have a professional show you the ropes for future. The secondary mirror can also cause a slight loss of contrast because it is an obstacle in the light’s path. The primary mirror is also exposed to the elements and will need to be maintained with regular cleaning – which a child can learn to do carefully – and recoating every few years. Refractors use a lens in place of mirrors. Lenses are heavy and expensive to manufacture, so even small aperture refractors can be costly. They also tend to have longer focal lengths (simply put, the tube is quite long) that can make storage an issue, but this isn’t often the case in newer models. Even a high quality lens will suffer from a slight bit of chromatic aberration, a flaw where the white light can spilt into rainbow colours. The flaw isn’t glaring with a good quality make. An added advantage of getting a refractor for a child, especially if they are still quite young or small, is that the eyepiece has a more convenient placement than on a typical Newtonian. The eyepiece is at the bottom of a refractor, giving children easier access. Refractors also require minimum maintenance. The two most common types of telescope mounts are alt-azimuth mounts and equatorial mounts. Alt-azimuth mounts have such a basic design you could properly build your own one. The mount essentially only holds the telescope. You don’t use the mount to aim or move to any section of the sky, rather, you use the telescope itself to move up and down and to rotate. They can be solid and sturdy, perfect for a heavier telescope, are cheap, and are easy to use. They require no real setup. This type of mount doesn’t track the stars and you wouldn’t be able to use it for astrophotography, but it is ideal for a young telescope owner. Equatorial mounts do track the sky. They often have a motorized system that not only follows objects, but can be programmed to find and go to any celestial object. They are more expensive and you will need to know how to setup the mount by aligning it. You will probably have to do this for your child, but it is relatively easy once you know how. The size of your telescope’s primary mirror or lens is its aperture. There is a degree of truth to “the bigger the better” motto, because a larger optic can reveal more of the night sky. Keep in mind that your telescope will need a secure mount appropriate for its size and weight. You may also need to sometimes transport and set up the telescope, and will require a sheltered place to store the instrument. It is important to find a size that is easy for your child to generally setup independently. Even a small quality telescope can reveal the Moon, the planets and their natural satellites, an assortment of star clusters, and even the brightest deep sky objects like galaxies and nebulae. Of course, it is important that your child has a realistic expectation of what these objects look like through a telescope, even the larger ones, to prevent any unnecessary disappointment. Telescopes show images usually lacking in colour and nothing like what you see in astronomy magazines. Gimmick telescopes that are marketed to kids often oversell magnification. A telescope’s magnifying capabilities depend on two factors: the telescope’s focal length, and the eyepiece’s focal length. You can go here to read more on eyepieces, focal length, and how to determine magnification. What is important to know is that objects have a limit on how much they can be realistically magnified. Any telescope raving about magnification over 200x is probably not worth its salt. You may wonder how many telescope accessories your child will really need for his/her new hobby. Thankfully, not much is needed to have an excellent basic setup of necessary accessories which last when maintained. Eyepieces and Barlow lens: Two or three quality designed eyepieces is all your child needs for viewing a collection of different celestial objects. Eyepieces that produce lower magnification are great for viewing nebulae and other deep sky objects. Medium to high magnification is a must for viewing planets and the Moon. A Barlow lens is not technically an eyepiece. Attaching your Barlow lens to the telescope before inserting the eyepiece will double or triple the eyepiece’s magnification. Colour filter kit: Filters are fitted to eyepieces and block/ allow different wavelengths of light. The filter changes how we can view the same object, and different filters used on the same object will enhance different features. A basic three colour filter set is excellent for exploring the solar system, and your child will love playing around with them. Star maps: Children enjoy knowing awesome facts they can share with you and their friends. Star maps are an inexpensive but valuable resource which will help your child learn the constellations and brighter stars in no time at all. They are also very easy to learn how to read. Of course, you could also get star maps software and apps which your child may appreciate just as much. Red flashlight: It makes sense that you will need a flashlight when your hobby is done outdoors in the dark, but only a red flashlight will do for nights stargazing with your kid. Our pupils adjust to low light environments by dilating; allowing us to see in the dark. Bigger pupils also gather more light. It takes about 20 minutes for our eyes to become fully dark adapted, and a harsh blue light completely undoes this. Red light has a longer and less energetic frequency which won’t disrupt the pupils. Basic maintenance kit: Finally, it is very important to show your child how to care for his/her telescope and accessories, starting from a young age. Basic supplies like microfiber cloths that won’t scratch the optics when you clean them, and cotton buds for cleaning eyepieces are inexpensive but very handy. Just be mindful that pure alcohol solutions are often used for cleaning optics, so keep these out of reach. Children gain so much from using a telescope. They develop a love for science and the beautiful outdoors, as well as a sense of wonder. Your child will grow with the best telescope for kids, and when you find it, it will have a place in your home for years.